Say what you will about the carbs and other maladies of pasta, but I don’t think there is a better way to complement a dish than simply adding some of to practically anything, going from sausages, vegetables, tuna or chicken (remember, I don’t cook with beef). When I was growing up, though, it was quite different. Pastas were always served buried in some variety of tomato sauce, and from what I remember it was almost always spaghetti. When I was at my Brazilian grandparents’ in Fortaleza, pasta was served almost every day as a side dish sautéed in onions, garlic and colored with “colorau,” a paprika-like powder made from achiote that is widely popular in northeastern Brazil. They use it on pretty much every dish under the sun since “pale” foods are considered unappealing in the region. Over the years, though, I learned that pasta dishes are as endless as the varieties they come in. You can make it with your favorite sauce (mine being puttanesca) or without any sauce at all – just adding some of the cooking water to whatever you mix your noodles to makes it for a savory, moist dish that does not weigh you down much, unless of course you have too much of it. The cooking water is very crucial – I like to salt it lightly because it helps to season it. Also, I always save a cup to add to the final phase of preparing the dish. As a recent (uncredited) article on Bon Appetit magazine stated, “starchy, salty pasta water is the secret ingredient in most sauces,” and it is true, because it makes the sauces richer. Also, if the sauce you are preparing seems a bit thick, the cooking water will help dilute the sauce for a more uniform experience. I have discovered many personal ways of making pasta dishes, and these recipes have made their way to what I call my ‘kitchen rotation.’ I am sure I haven’t even scratched the surface yet, since there are so many different ways of preparing the Chinese invention that Italians turned global. 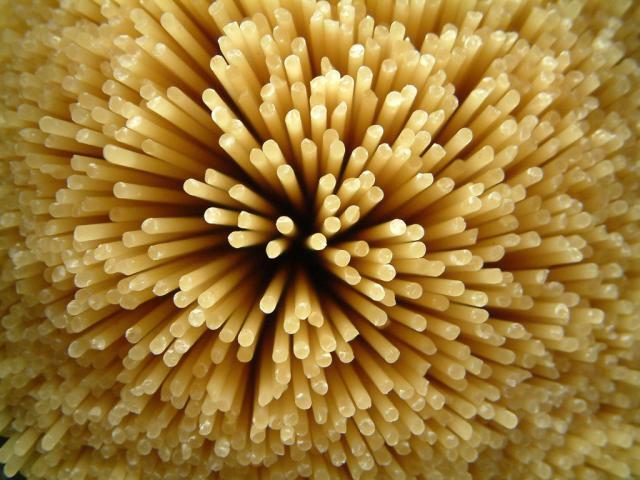 Cook the pasta with salted water until al dente. Drain, reserving 1 cup of the cooking water and reserve. In the meantime, sauté the sausages in the olive oil until lightly browned. Add the garlic and onions and stir-fry until softened and fragrant. Add the peppers and continue stirring for about 2 minutes, and add the mixed vegetables, stirring for another two minutes. Remove from heat, season with salt and pepper and add dried oregano. Toss the pasta with the sausage mix and cooking water and serve drizzled with raw olive oil and parmesan cheese. Not going to lie Ernest, this looks absolutely delightful. I am going to try this recipe this weekend. I’m trying to cut out a lot of red meat yet maintain good flavor. This sounds and looks like it fits the bill.